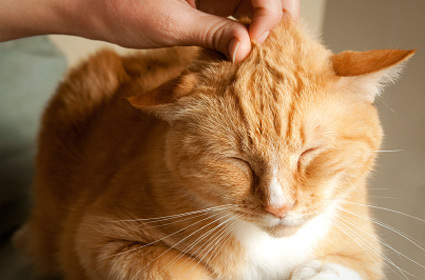 It's no secret that caressing a purring cat is a pleasurable experience — studies suggest it even lowers your blood pressure. But the mechanics of purring itself (to say nothing of the reasons why cats purr in the first place) remains a mystery. The most common explanation is that a purr originates in the voice box with what are called the "vestibular folds," or false vocal cords. The passing of air across these structures is thought to get the engine running. Cats purr when they're happy, but cats also purr if they're injured, while giving birth and even when dying. In his masterwork, Catworld: A Feline Encyclopedia (Penguin Reference), British zoologist Desmond Morris has observed that purring is "a sign of friendship — either when (the cat) is contented with a friend or when it is in need of friendship — as with a cat in trouble." If you think about it, a purr is kind of like a smile: Sometimes you smile from happiness, sometimes from nerves. As with a smile, there's no such thing as a purr that isn't welcome. Cats know this themselves. Kittens start purring even before they open their eyes, rumbling while nursing with what must be a reassuring sound to their mother (who's likely purring herself). It's pretty special that no big cat can get his motor running the way our household kitties can. Cats purr as effortlessly as breathing, both in and out. In other words, your cat can do something even the biggest, most handsome and imposing Kings of the Jungle can't: Cats purr, lions don't! Sure, tigers can rumble a tiger-sized purr-like sound, but on the exhale only — and really, who wants a tiger sleeping on their bed, anyway?